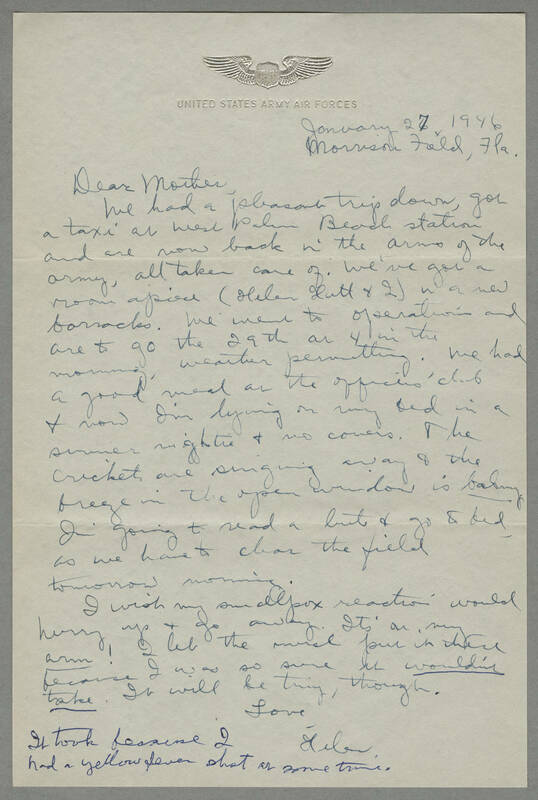 January 27, 1946 Morrison Field, Fla. Dear Mother, We had a pleasant trip down, got a taxi at West Palm Beach station and are now back in the arms of the army, all taken care of. We've got a room apiece (Helen Hutt & I) in a new barracks. We went to operations and are to go the 29th at 4 in the morning, weather permitting. We had a good meal at the officers' club & now I'm lying on my bed in a summer nightie & no covers. The crickets are singing away & the breeze in the open window is balmy. I'm going to read a little & got to bed, as we have to clear the field tomorrow morning. I wish my smallpox reaction would hurry up & go away. It's on my arm! I let the nurse put it there because I was so sure it wouldn't take. It will be tiny, though. Love, Helen It took because I had a yellow fever shot at same time.